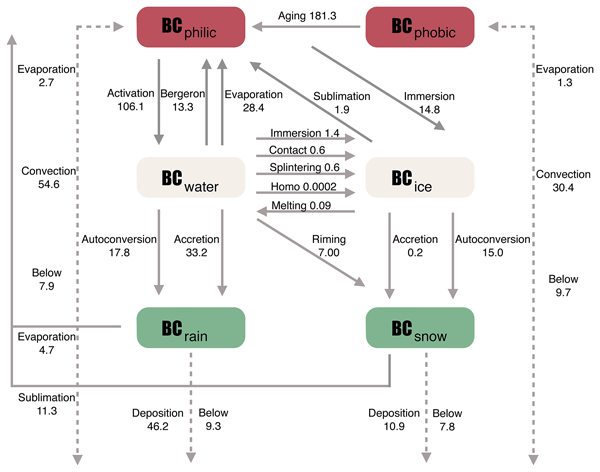 A new cloud parcel model that simulates entrainment, condensational growth, and collision–coalescence processes is presented and evaluated against airborne observations in complex terrain during IPHEx. 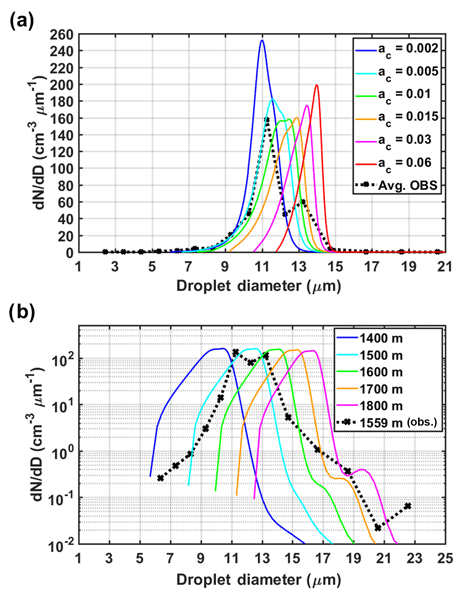 Analysis of model simulations reveals that nonlinear interactions among turbulent dispersion, activation, and droplet growth processes modulate spectral width and explain the emergence of bimodal cloud drop spectra in aircraft measurements from different cloud regions and at different heights. Recently, haze pollution in the North China has been serious and disastrous. The preceding heavy autumn sea ice intensified the early winter haze pollution over North China. The results provide possibilities for the seasonal to interannual prediction of haze pollution that helps to determine whether extra stringent emission control measures are needed to counteract the effect of climate variability. 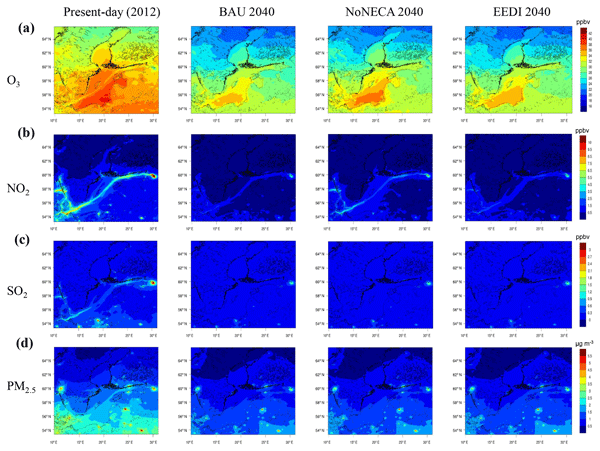 We quantified the detailed impacts of meteorology and anthropogenic emissions on surface O3 increase in central eastern China between 2003 and 2015 using GEOS-Chem. The emission change plays a more important role than the meteorological change, while the regions with a larger O3 increase are more sensitive to meteorology. NMVOC emission change dominated the O3 increase in eastern CEC, while NOx emission change led to an O3 increase in western and central CEC and O3 decrease in urban areas. We measured the viscosity and diffusion of organic molecules in secondary organic aerosol (SOA) generated from the ozonolysis of limonene. 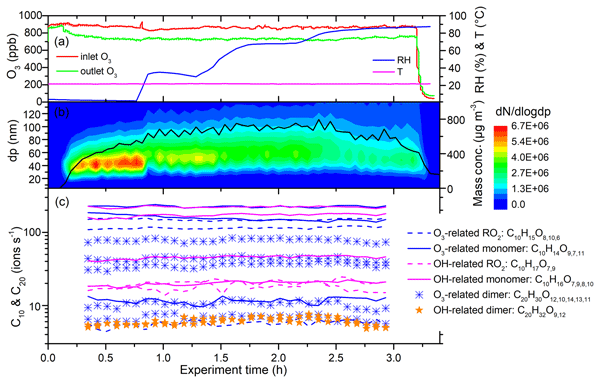 The results suggest that the mixing times of large organics in the SOA studied are short (< 1 h) for conditions found in the planetary boundary layer. 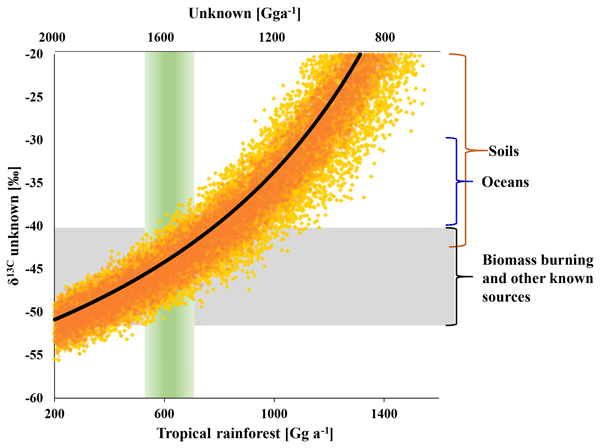 The results also show that the Stokes–Einstein equation gives accurate predictions of diffusion coefficients of large organics within the studied SOA up to a viscosity of 102 to 104 Pa s.
As the population in West Africa grows and air pollution increases, it is becoming ever more important to understand the effects of this pollution on the climate and on health. Aerosol particles can grow by absorbing water from the air around them. 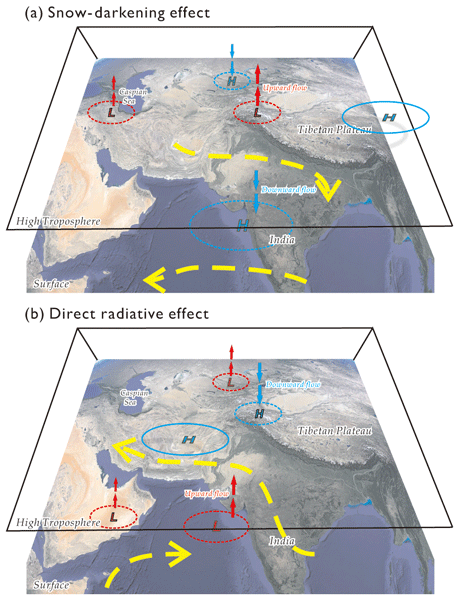 This paper shows that during the monsoon season, aerosol particles in the region are likely to grow significantly because of the high moisture in the air. This means that climate effects from increasing pollution will be enhanced. We performed lab experiments to explore the role of relative humidity, RH, in atmospheric monoterpene oxidation and new particle formation. These studies will provide insights into the most important steps in the process, while also more accurately representing the real atmosphere. We found that the detected compounds did not change with RH, and in fact could mostly be fully explained by the autoxidation of organic peroxy radicals followed by bimolecular reactions with other peroxy radicals. 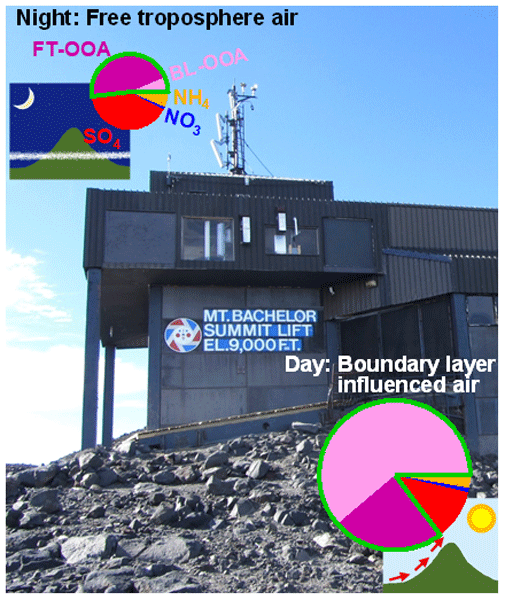 Regional background aerosols in the western US were studied from a mountaintop observatory during summer. Oxygenated organics and sulfate were dominant aerosol components. 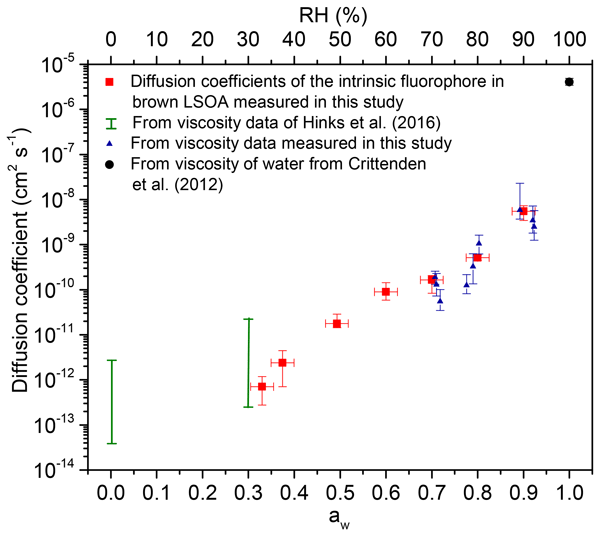 However, free tropospheric aerosols were more enriched in sulfate, frequently acidic, and comprised mainly of highly oxidized low-volatility organic species. 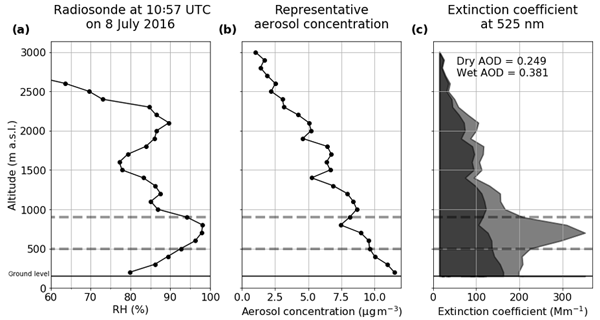 In contrast, organic aerosols in the boundary-layer-influenced air masses were less oxidized and appeared to be semivolatile. 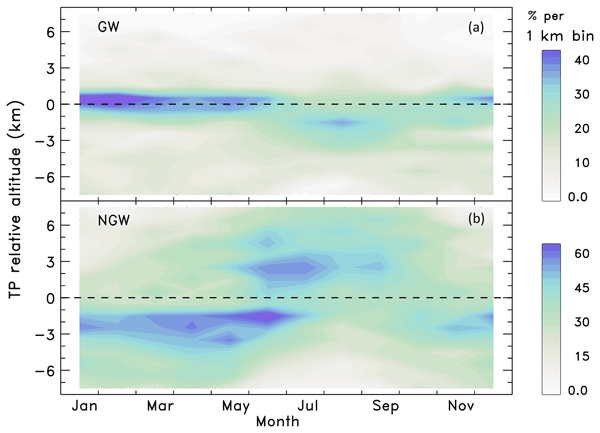 The role of low-level clouds in the southern West Africa (SWA) energy balance and the West African monsoon system is assessed via targeted sensitivity studies with the NWP model ICON. We show for the first time that rainfall over SWA depends logarithmically on the optical thickness of low clouds, as these control the diurnal evolution of the planetary boundary layer, vertical stability and finally convection. 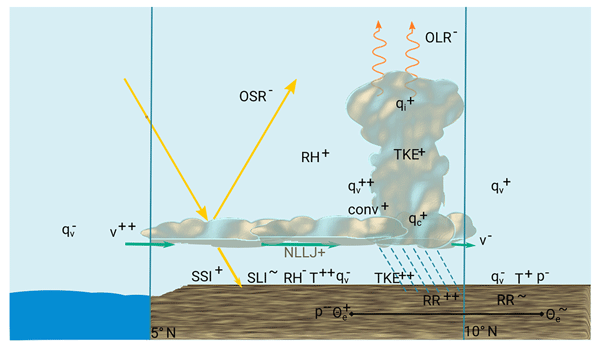 Small variations in clouds or aerosol have a substantial impact on precipitation. 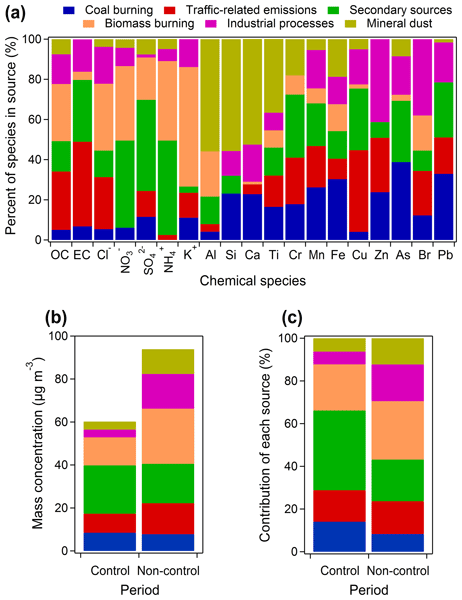 The abundance and diversity of airborne biological particles in different environments remains poorly constrained. Measurements of such particles were conducted at four sites in the United Kingdom, using real-time fluorescence instrumentation. 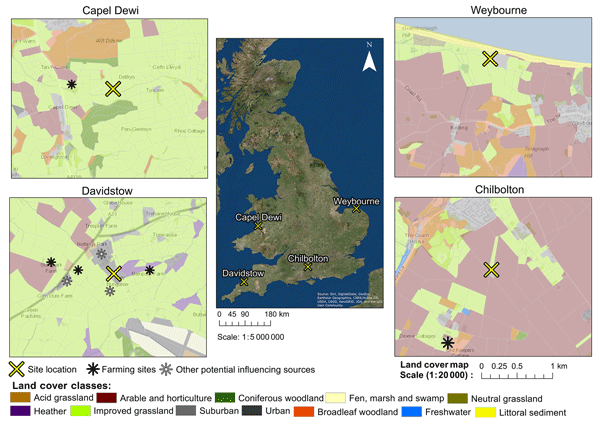 Using local land cover types, sources of suspected particle types were identified and compared. Most sites exhibited a wet-discharged fungal spore dominance, with the exception of one site, which was inferred to be influenced by a local dairy farm. The vertical distribution of fire smoke and factors that control its rise had not yet been quantified across the Amazon. We developed a satellite-based long record of smoke plume heights. We find that smoke heights are driven by many factors: vegetation, seasonality, time of day, fire intensity, and atmospheric and drought conditions. Also, drought increases fire pollution, with implications for air quality. Policies to control fires may be crucial in the future as more droughts are projected. Air emissions of nitrogen oxides from ship traffic in the Baltic Sea are a health concern in coastal areas of the Baltic Sea region. We find that the introduction of the nitrogen emission control area (NECA) is critical for reducing ship emissions of nitrogen oxides to levels that are low enough to sustainably dampen ozone production. The decline of the ship-related nitrogen deposition to the Baltic Sea between 2012 and 2040 varies between 46 % and 78 % in different regulation scenarios. Wind–wave interaction can suppress gas transfer between the atmosphere and the ocean. 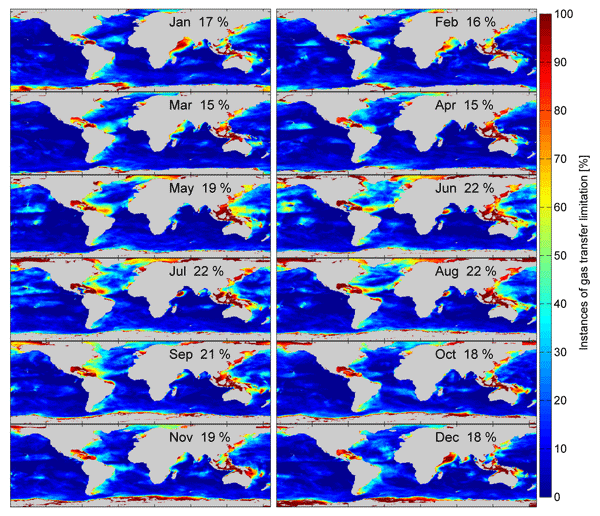 Using a global wave model we investigate the impact of this interaction on the global gas transfer of CO2 and DMS. 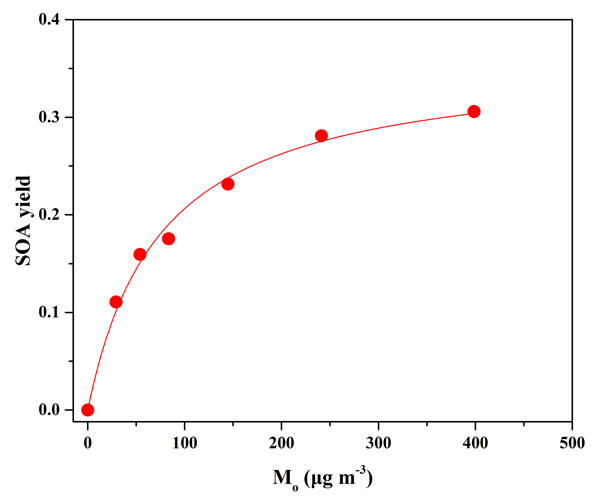 We also investigate the impact on of gas transfer limitation on two commonly used gas transfer velocity parameterizations. 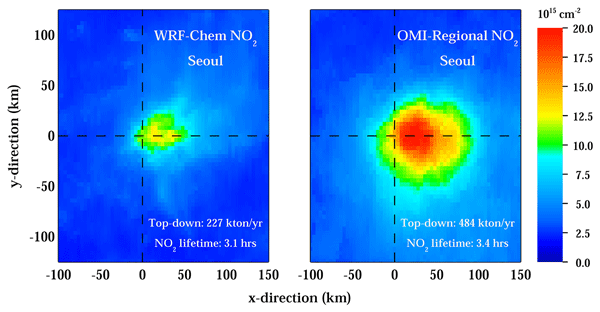 A model was developed to derive night-time atomic oxygen (O(3P)) and atomic hydrogen (H) from satellite observations in the altitude region between 75 km and 100 km. Comparisons between the best-fit model and the measurements suggest that chemical reactions involving O2 and O(3P) might occur differently than is usually assumed in literature. This considerably affects the derived abundances of O(3P) and H, which in turn might influence air temperature and winds of the whole atmosphere. 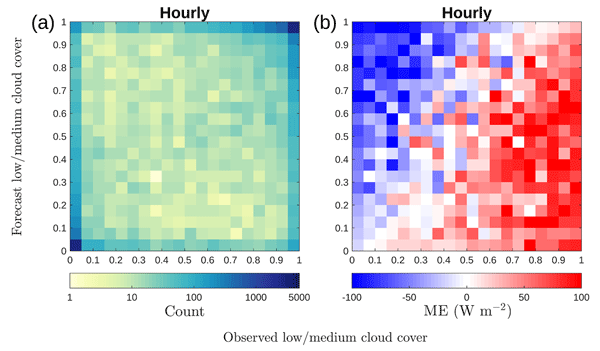 We analyzed balloon measurements of ozone between the surface and 25 km altitude above Boulder, Colorado, and developed an algorithm to detect and classify layers of either unusually high or unusually low ozone. These layers range in vertical thickness from a few hundred meters to a few kilometers. We found that these laminae are an important contributor to the overall variability in ozone, especially in the transition region between the troposphere and stratosphere. Acyl peroxy nitrates (APN) were measured near the ground in Alabama using GC in summer 2013 to study biosphere–atmosphere interactions. APN were lower than measured in the SE USA over the past 2 decades. Historical data showed APN in 2013 was limited by NOx and production was dominated by biogenic precursors more than in the past. 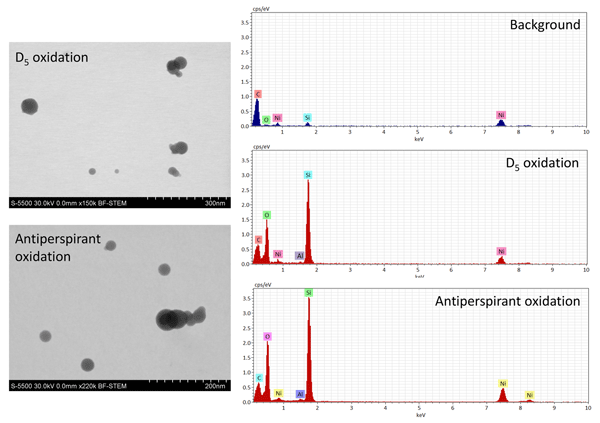 Isoprene-derived MPAN correlated with isoprene hydroxynitrates as NOx-dependent products. 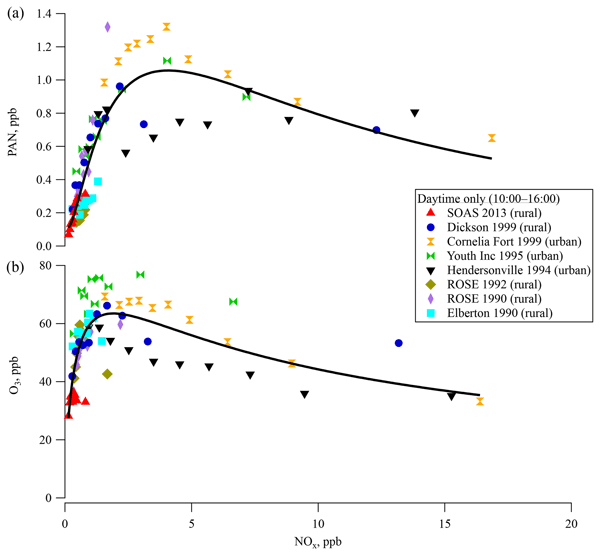 MPAN varied with aerosol growth, but not with N-containing particles. The Asian monsoon anticyclone (AMA) is an annual phenomenon in the northern hemispheric upper troposphere (UT) and lower stratosphere. 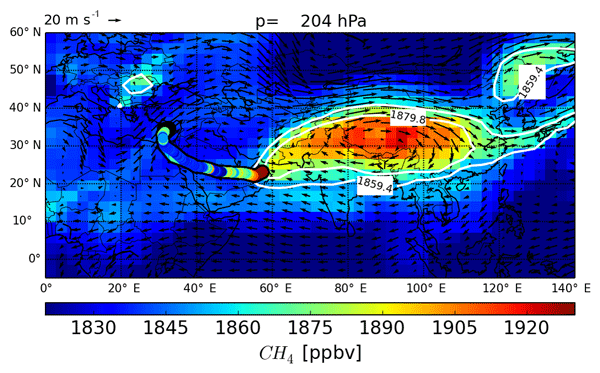 We performed in situ measurements of carbon monoxide (CO) and methane (CH4) in the monsoon outflow region and in background air in the UT (Mediterranean, Arabian Peninsula, Arabian Sea) using airborne optical absorption spectroscopy during the Oxidation Mechanism Observations mission (summer 2015). The trace gases increased within the AMA, particularly CH4. 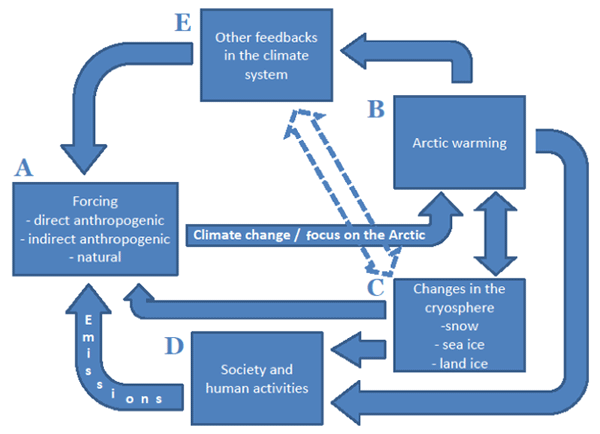 The Arctic marine climate system, ecosystems, and socio-economic systems are changing rapidly. 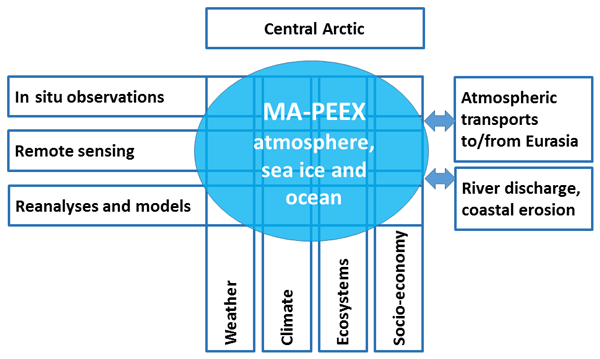 This calls for the establishment of a marine Arctic component of the Pan-Eurasian Experiment (MA-PEEX), for which we present a plan. 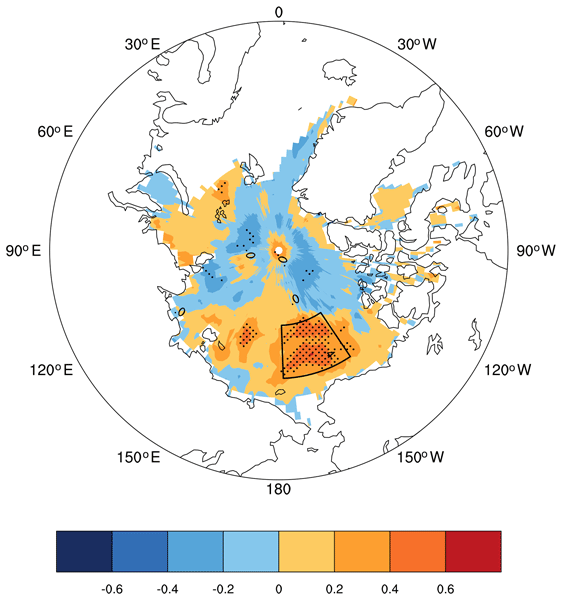 The program will promote international collaboration; sustainable marine meteorological, sea ice, and oceanographic observations; advanced data management; and multidisciplinary research on the marine Arctic and its interaction with the Eurasian continent. Gaseous sulfuric acid is one of the key precursors for atmospheric new particle formation processes, but its measurement remains challenging. 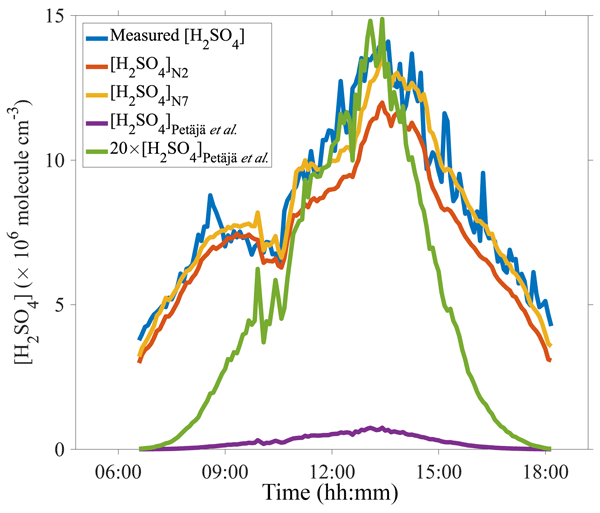 This work develops an estimation method for the gaseous sulfuric acid concentration in an urban environment in China using multiple atmospheric variables that are easier to measure. The consideration of the heterogeneous formation of HONO and the subsequent photo-production of OH radicals improves the performance of the estimation method. Many applications require accurate forecasts of the amount of solar radiation reaching the surface, such as solar energy and UV radiation forecasts. This also means that cloud must be correctly forecast. We investigated the skill of these forecasts over Helsinki, Finland, using cloud and solar radiation observations. 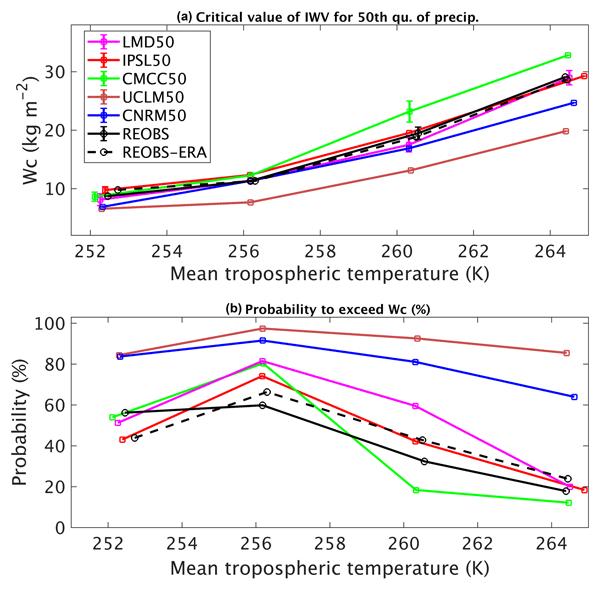 We found that there were errors in the model radiation forecast even when the clouds were correctly forecast, which we attribute to incorrect representation of the cloud properties. The rate constant and SOA formation for the OH-initiated reaction of eugenol were studied for the first time in an oxidation flow reactor. Significant SOA formation was observed, and SOA yield depended on precursor concentration and OH exposure. SO2 and NO2 both enhanced SOA yields. In addition, NO2 participated in OH-initiated reaction and produced organic nitrates. The results could be helpful for further understanding SOA formation from the atmospheric oxidation of methoxyphenols. The Nordic Centre of Excellence CRAICC (Cryosphere–Atmosphere Interactions in a Changing Arctic Climate), funded by NordForsk in the years 2011–2016, is the largest joint Nordic research and innovation initiative to date and aimed to strengthen research and innovation regarding climate change issues in the Nordic region. The paper presents an overview of the main scientific topics investigated and provides a state-of-the-art comprehensive summary of what has been achieved in CRAICC. Air quality in rapidly developing East Africa is a growing but understudied concern. 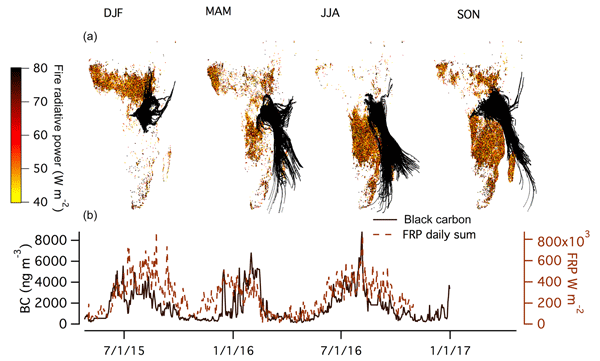 We analyzed long-term black carbon, carbon monoxide, and ozone measurements from the remote Rwanda Climate Observatory and found that seasonal regional biomass burning raised black carbon levels to above-urban concentrations 6 months out of the year. Additional local pollution could exacerbate this issue. More regional monitoring needs to be done to understand and reduce air pollution in this region. This study investigates solar effects in radio reflection height observations in the ionospheric D region at an altitude of about 80 km at northern midlatitudes. The analyzed time series covers almost six solar cycles. 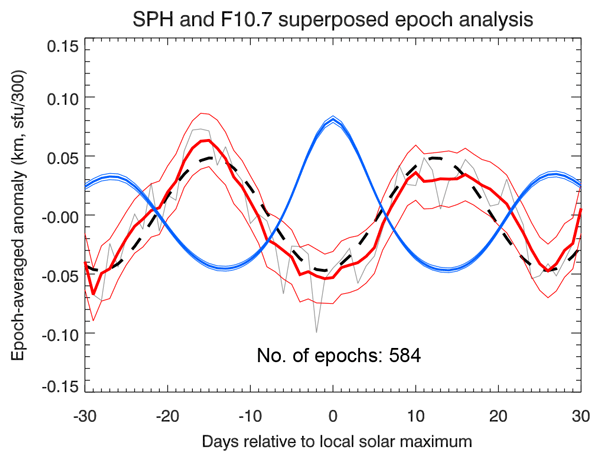 Statistically significant solar 27-day and 11-year signatures are identified. However, the driving mechanisms are not fully understood. We also provide evidence for dynamical effects on the radio reflection heights with periods close to the solar rotational cycle.